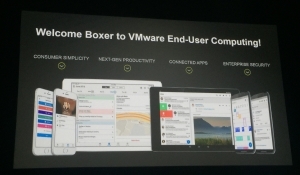 While the announcements were light, apart from the acquisition of Boxer a cloud enabled email client (presumably for AirWatch) the conference was certainly a-buzz with EUC mutterings. From an EUC perspective, the only keynote worth speaking of was Sanjay Poonen’s “day two” general session where he absolutely dominated the stage as he presented on Mobility and Desktop Virtualisation. Sanjay is an incredible speaker, I was impressed at how well he presents and he threw in some real humour from singing “Let it go” to any people in the audience using a blackberry, to trying really hard to get the tired, mostly hungover crowd to sing “EUC will rock you“. Credit to him for trying but man did they not want to play! Sanjay personified this keynote for me with his presence and character. Sanjay went full VMware mode and threw out some really big claims like “in 2007 vmware first coined the term workspace suite“, “VMware have innovated more in EUC in the last 18 months than others in 5 years” and “We (VMware) are the only company that can bring any application to any device”. The reception was well taken and I love VMware in this regards, they’ve got the clout and stones to say these kind of things, but we could argue those points to death! We got some really nice demo’s on Project A squared, more on that later. 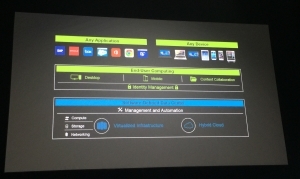 We got some demo’s on NSX and Airwatch, demo’s on VMware’s SSO component running applications on a Tesla and more talk of innovation and “combining consumer simplicity and enterprise security.” One thing’s for sure, VMware are gearing up for some serious EUC action and everyone from Airwatch, to AppVolumes and even Mirage are playing ball in this vision. In short, Sanjay is awesome and I look forward to seeing more from him. Microsoft were on stage again talking about Windows 10. While the first time this happened it felt a bit tongue in cheek, Sanjay went on again to clarify the partnership VMware and Microsoft are carving out in the EUC space. I’m still skeptical and so is Thomas (hi Thomas) but hey, thats me. I still see Microsoft as the single, greatest threat to all players in this space if they ever get their act together, but again, that’s me. 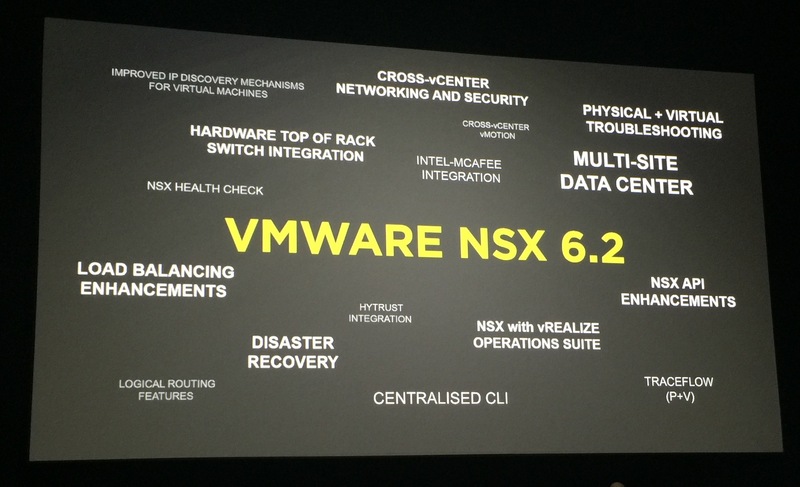 VMware had NSX up front and centre for this keynote. Slinging phrases like “NSX is going to become THE industry standard”. NSX had some really cool demo’s from load balancing, live debugging and application layer security with vRealise Ops. VMware are selling NSX as Dev OPS for networking and I can see why. Personally I don’t see much of NSX in the wild, but adding a SKU for the Horizon suite for the load balancing and segmentation would really add some value *Hint* *Hint*. 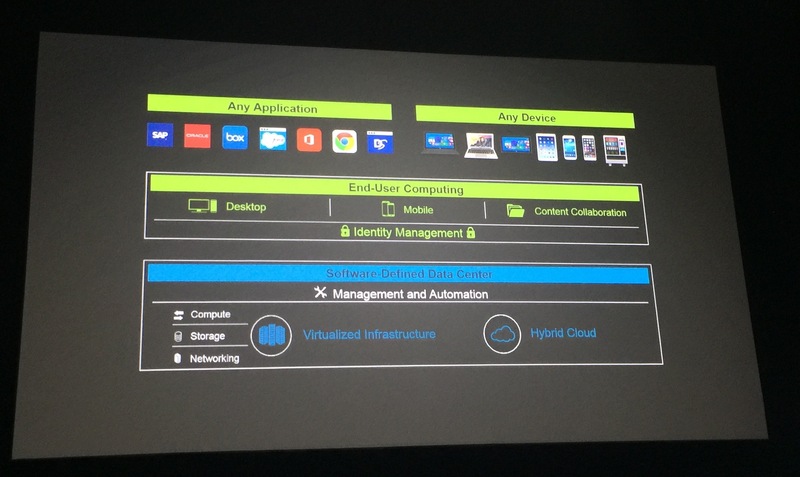 A cool concept and VMware’s vision for the future of Application delivery. In his session, Harry Labana spoke about the ability to use MDM and Device management policies in air watch to deploy VHD style AppVolumes applications over the air to Windows 10 devices. This was further hammered home by Sanjay. Where the enterprise tools of the past (Group policy, etc) always struggled was ‘off network’. Group policy, etc. are of pretty much no use when the device is outside of the perimeter. AirWatch’s technologies can absolutely overcome this and allow a “managed everywhere” approach for Windows 10 devices. With mobile and broadband networks, getting the apps and disks out to the devices could be no easy task. With technology available to VMware from Mirage, this could be cleverly utilised almost similarly to the Microsoft BITS service for transfer. In the keynote Demo, applications were imported “automagically” from Microsoft SCCM and installed into AppVolumes AppStacks. This made me laugh when you think that the video from Microsoft had literally just finished, but I digress. These AppStacks were then assigned to the client devices via AirWatch EMM and the devices began to download and mount the packages. Don’t get me wrong… there was a wiff of vapourware and wire frames here, but the technology is absolutely sound and VMware are more than capable of pulling this off. What i truly like about this example, is its ability to natively reship and re-use AppVolumes AppStacks both inside and outside of the datacenter giving you a single method to deploy applications. No more scripting installs, dealing with non standard MSI’s, command line executables, etc. Install them once as you would natively and spray them out to your Desktop Virtualisation or mobile platform using VMware’s suite of products. This is not for today as I said, there are still organisations struggling with Windows 7 adoption, let alone windows 10. But it’s fantastic to see the future vision from VMware shining through here and it’s a technology to watch. One of the disappointments this week (of which there were few, if I’m honest) was the lack of information around Project Enzo and my personal favourite technology idea JIT and Fargo (just in time desktops based of Live VM forking). Neither of which were present in any great detail and that “q4 availability” promise is looking tight! I don’t really see much changing with EMC and Dell having a fling, I doubt this will greatly affect VMware in a negative way and hell, VMware now have a very close server hardware and even thin client hardware ally. With any luck their new Hardware Overlords will help move Evo:Rail and Evo:Rack into the realms of very competitive. I’m personally just watching to see how long it takes for Dell and Nutanix to come to fisty cuffs, but hey, that mightn’t happen either. Who Knows what will happen to VCE, they’re playing along and pretending everything is ok… but i doubt anyone cares. Will Cisco decide to converge and buy Citrix for XenServer, the promise of Melio / Dom0 integration and Netscaler platform? would kinda make sense now. But it’s pretty clear Citrix’s rumoured advances were in vain. Time will tell where this is going, nobody really cares for now. 2016 is shaping up to be a big year where VMware and Citrix are really going to have to fight it out to emerge as the king of the “Enterprise Workspace” technology, I have my popcorn ready.